Australia had bad news before the match they have to win that match because previous match against South Africa was ruled out because of rain, If they lost match against home side then they not able to reach to final of the tri series and that was not good for world champion. Australia starts well with the ball butÂ Marlon Samuels' first-ever hundred against Australia and a record-breaking partnership with Denesh Ramdin lifted the West Indies to a competitive 282 for eight batting first. The West Indiesâ€™ total was built on a fine 125 off 134 balls from Marlon Samuels and his record fourth-wicket stand of 192 with Denesh Ramdin, who compiled 91 off 92 deliveries. It was challenging total for Ausies and windies bowlers have to bowl well and they did well by sending their both openers back where score was just 35. Smith and George Bailey added 64 for the third wicket to turn the momentum, while Marsh and Smith further consolidated Australiaâ€™s advantage.Â When Smith was run out, there were still 62 needed from 8.2 overs. Maxwell played match winning inningÂ , including a switch-hit six off Sunil Narine as the run chase was completed in style.Â Maxwell scoredÂ innovative 46 not out off 26 balls to help Marsh reach the victory target in the next-to-last over. 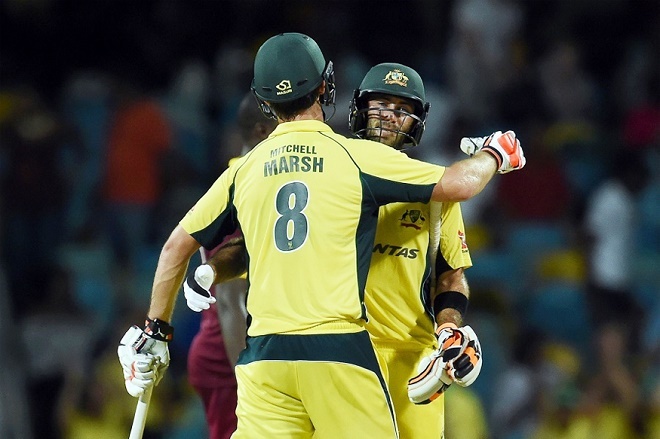 Mitchell Marsh hit an unbeaten 79 and captain Steve Smith scored 78 in a 122-run stand Tuesday to lead Australia to a six-wicket victory over the West Indies and a spot in the final of the limited-overs tri-series. Australia reached 283-4 with eight balls to spare, surpassing the West Indies 282-8. Earlier, the 35-year-old Samuels struck 14 fours and two sixes in compiling his 10th ODI century, this effort earned him the "Man of the Match" award. "We put in a good effort but being a bowler short for most of the innings cost us," said West Indies captainJason Holder, who could only deliver two overs before leaving the field with a leg injury. "We have to lift ourselves to face South Africa on Friday and I'm confident of us putting in a good effort." West Indies and South Africa will now meet in the last preliminary match on Friday with the winners to face the Aussies in Sunday's final.